That's all from the BBC Africa Live page this week. 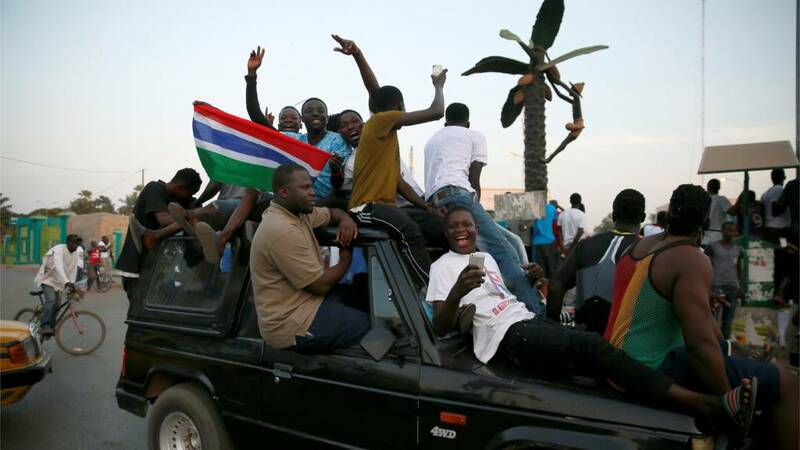 Keep up-to-date with what's happening in The Gambia on the continent by listening to the Africa Today podcast or checking the BBC News website. An old person's skin is full of eyes. And we leave you with one of our top shots from across the continent this week. This Gabonese football fan watched the Africa Cup of Nations match earlier in the week week. Keep up-to-date with the tournament on BBC Sport. The Confederation of African Football tweet that the Ivory Coast have drawn with Democratic Republic of Congo in the latest match of the Africa Cup of Nations. Speech to be given at Banjul airport? Red carpets have been laid out at the airport in Gambia's capital in what appears to be preparations for a speech and a departure, AP reports. The red carpets are laid out for a wooden podium and for the Mauritanian plane that brought the leaders to Banjul. Banjul airport readies for departing presidents - is Jammeh with them? The latest tweet from internationally recognised president of the Gambia Adama Barrow hints that he may be leaving Senegal. Will Trump rebuild ties with Zimbabwe? As Donald Trump becomes the president of the US, Zimbabweans are wondering if he will seek to rebuild ties with President Robert Mugabe. Mr Mugabe's government has said it hopes the change in the status quo might help it restore ties with Washington. Mr Mugabe, some of his officials and some government-owned companies have been under travel and economic sanctions since George W Bush's presidency over alleged human rights abuses. Mr Mugabe believes the sanctions are illegal. But Mr Trump has not made any statement about Zimbabwe or Mr Mugabe and there is no indication his stance on Zimbabwe will differ from his predecessor's. The Mozambican authorities say the number of victims of the torrential rains and strong winds, in many parts of the country, over the past two weeks has risen to 40 and the number of those directly affected by the calamity stands at more than 70,000. In addition, they say the storm has left a trail of destruction, flattening houses, schools, hospitals, access routes and electricity pylons. The government, which has just issued an orange alert, is advising people to move to higher and safe ground. The situation is so serious that it forced the government to convene an emergency meeting of the technical committee of the national relief agency, the Disasters Management Institute or INGC chaired by the Mozambican prime Minister, Carlos Agostinho do Rosario. Will Kenyans be deported in Trump's America? As Donald Trump becomes the president of the US there are questions over what this means for Kenyans in the country. Up to one third of the 90,000 Kenyans in the US are illegal immigrants, according to the Pew Research Centre. This means that more than 30,000 people could be sent back to Kenya if President-elect Donald Trump makes good his campaign pledge to deport illegal immigrants. That would badly hit the remittances they send home, estimated at $60m from the US and Canada in 2015. It could also mean the end of the road for thousands of young people from poor backgrounds hoping to study in the US under scholarships, which Mr Trump has sworn to eliminate as soon as he takes office. Members of Mr Trump's transition team assessing US relations with Kenya and Africa have raised concerns over comments about future ties. The transition team has questioned why the US has been fighting al-Shabab for a decade yet has not won. And it has questioned whether the money that Washington donates to various causes in Africa is being spent wisely. What will the Trump era mean for aid to Uganda? As Donald Trump becomes president of the US, Ugandans will be wondering whether there will be changes in the aid the country gets from the US. The US government provides more than $700m (£570m) in assistance to Uganda every year. The majority of this aid goes to health programmes, particularly free HIV/Aids medication for those who need it. An unspecified amount is also given in military support. No details are given but as Uganda has increased its missions abroad, including to Somalia and the Central African Republic, Washington has been a key financial backer. It also provides training for Ugandan soldiers. In a recent letter to the US State Department, Mr Trump's transition team asked about these activities. The worry in Kampala is that the new administration will stop or reduce this support. On the other hand, some in the opposition have argued that foreign financial backing has given the government an unfair advantage. In the health sector, reduced US support could leave many in the cold. What now for US-Nigeria trade deals in Trump era? As Donald Trump becomes US president, Nigerians will be wondering what it means for trade deals. Since the election of President Muhammadu Buhari last year, Nigeria has improved ties with the US. Relations had been severely damaged by accusations against the Nigerian military of human rights abuses, especially in the fight against Boko Haram Islamist militants. The Nigerian military received training and equipment from the Obama administration and would surely want Mr Trump to maintain these improved ties. Nigeria would also want better trade relations with the world's largest economy. Some of the biggest US companies are among the major investors in Nigeria's energy sector but the exploitation of shale gas in the US has led to a reduction in the amount of oil the US buys from the West African nation. They join Botswana, which recognised Mr Barrow as the legitimate Gambian president on Thursday. Earlier we reported that Yahya Jammeh and the presidents of Mauritania and Guinea had taken a break from talks to pray. Internationally recognised President Adama Barrow has also been praying - he tweeted this photo of him and Senegalese President Macky Sall "praying for peace in The Gambia". See earlier post for more details. As Donald Trump becomes the president of the US, South Africans will be wondering what it means for us. South Africa has gone to great lengths to position itself not as a country in need of aid but as a formidable trade partner. But tough negotiations with the US on the African Growth and Opportunity Act (AGOA) late last year were perhaps a reminder to the developing country of its actual place at the big table. Some critics of the treaty say South Africa, like many African countries, was strong-armed into accepting less than favourable terms for the sake of having a powerful ally. The US has been accused of dumping chicken, which is said to be crippling South Africa's poultry industry. Trade union federation Cosatu claims the deal could lead to further job losses here - especially in the poultry industry. Mr Trump has a reputation of being a shrewd businessman, and while it's not clear what his policy on South Africa will be, some here are worried that the somewhat cosy relationship South Africa has enjoyed for years may be shaken up. They suggest the businessman's administration might require South Africa to show why it deserves to be on Mr Trump's team. Anyone else reminded of his reality show The Apprentice? Money transfer company Western Union has agreed to pay $586m (£476m) and admitted to turning a blind eye as criminals used its service for money laundering and fraud, Reuters news agency report US authorities as saying. The settlement will fund refunds for customers who were victims of scams, authorities said. In 2010 Western Union was fined $94m by the state of Arizona for not doing enough to prevent money laundering by Mexican drugs gangs. The 16:00 deadline for Yahya Jammeh to make up his mind over his future has passed. It was pushed back from a noon deadline earlier in the day. Reports say Mr Jammeh's former vice-president, Isatou Njie-Saidy, is at State House as last chance negotiations there continue. The Mauritanian and Guinean presidents are there trying to persuade Mr Jammeh to leave the country with them. Gambian journalist Saikou Jammeh says the longtime leader has his own ideas and is likely to make a public statement. DR Congo one up against Ivory Coast! Gambia's army chief General Ousman Badjie has told Reuters news agency that he saw internationally recognised President Adama Barrow as the new commander-and-chief and would not fight a regional force poised to depose Yahya Jammeh. Quote Message: We are going to welcome them with flowers and make them a cup of tea. We are going to welcome them with flowers and make them a cup of tea. Quote Message: This is a political problem. It's a misunderstanding. We are not going to fight Nigerian, Togolese or any military that comes." This is a political problem. It's a misunderstanding. We are not going to fight Nigerian, Togolese or any military that comes." Dressed in white and blue t-shirts with red caps, a group of around 100 mainly women danced and marched to congratulate US President-elect Donald Trump on his inauguration. Under the sound of a brass band, the group danced and each waved the US flag as they marched on Snapper Hill to the US embassy where they presented a statement of “full support” to the Trump administration. “We trust that the coming administration will make America great again, thus continuing to lead the world by great example,” the one-page statement said. The head of the parade, Cecelia Siaway-Teah, president of the Women Movement of Liberia, told reporters after the presentation that they were moved to march for Trump and honor him because “he challenged all obstacles” as he contested the presidency. She said the parade was “to show the Americans that we appreciate their democracy”. An embassy official received the statement on behalf of Ambassador Christine Elder. Liberia was founded by freed slaves from the US in the 19th century; its constitution, form and system of government and flag are all modelled on those of the US. Many of the pre-war presidents were born in the US. Scores of people have been injured during a solidarity rally in Port Harcourt by members of the Indigenous People of Biafra (IPOB) in support of the inauguration of Donald Trump as US President. The pro Biafra members in their hundreds converged in Port Harcourt this morning from different states in eastern and southern Nigeria. They were confronted by soldiers with military trucks and tanks and prevented from proceeding further into Port Harcourt main town. Reports indicate many members of the group, mostly women and youths, were injured with various degrees of bullet injures and bruises when the soldiers opened fire to disperse the procession. Traffic and commercial activities were paralysed in parts of Port Harcourt during the military operation to stop the rally. Pro-Biafran news outlets have reported that about 10 people have been killed but police in Port Harcourt have denied any killing. They say they merely employed minimal action. The activists have been campaigning for a breakaway state in the east of the country and endorsed the Republican candidate during the presidential race in the hope he would recognise their independence movement - especially after his comments about "self-determination" in regard to Brexit.